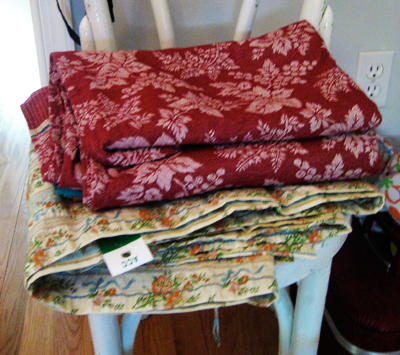 Bedroom: Thrifted fabrics awaiting (and providing) inspiration. 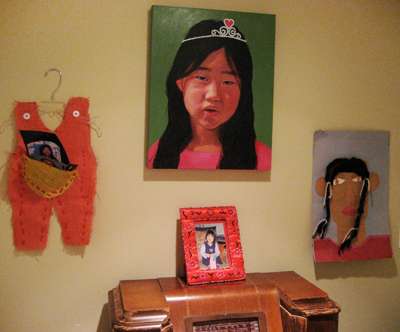 Foyer between designfarm office and so charmed studio: The Molly Shrine, featuring painting by Carrie Mitchell (center) and self portrait collage with braids by Molly (age 7ish). 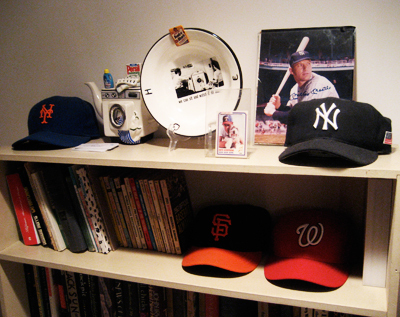 Entrance to basement at bottom of stairs: One of several household baseball shrines. 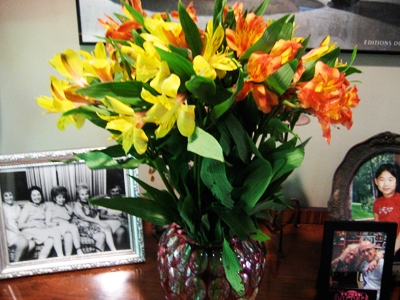 Dining room: Flowers from the BF. Weekly. No, I’m not kidding. 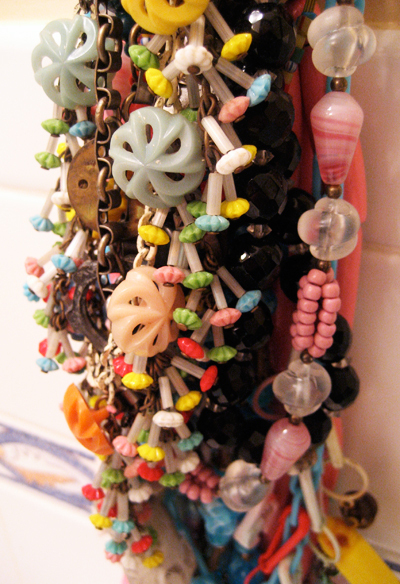 Bathroom upstairs: Favorite bling photo for Jody Pearl’s weekly JaM blog post. Bathroom upstairs: Favorite bling photo #2 for Jody Pearl’s weekly JaM blog post. 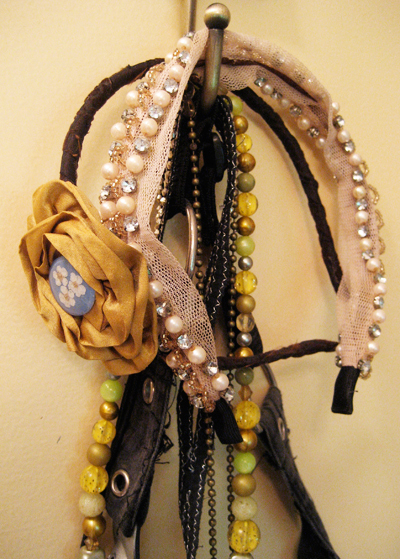 Bathroom upstairs: Favorite bling photo #3 for Jody Pearl’s weekly JaM blog post. Bathroom upstairs: Yes, it’s the back of the toilet. 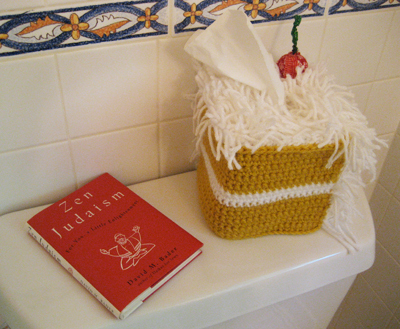 Yes, that’s a book entitled “Zen Judaism.” Yes, that’s a kleenex box cover handcrafted by Bethy in the shape of a piece of coconut cake. 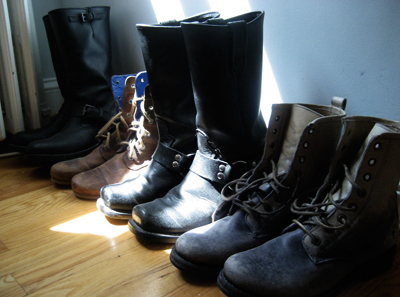 Bedroom: The cavalry is coming, ie, Jodi’s boots. Details added 4.14: From front to back: Molly’s old riding boots, Fly London, my oldest boots, pole climbers by NaNa… have been all over the world with me, blue vintage riding boots, burgundy vintage riding boots. Bedroom: The cavalry is coming Part 2, ie, MORE of Jodi’s boots. Details added 4/14: from back to front, thrifted Frye engineers, Fluevogs from SF with coolest blue lining, thrifted Harley harness boots… fit like a DREAM and were nearly new when found, newest boots: Frye tan lace ups. What a fun post! Love your bling and your boots- especially the blue ones. I now realize there is a blue-boot-shaped hole in my life that needs to be filled. Jenna, thanks so much for writing. I spent some time today on your wonderful blog too… GREAT earrings and I really loved the vid of you and Kim!!! 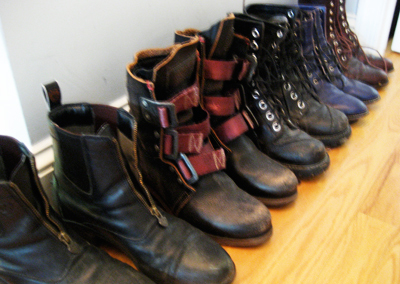 The blue boots you’re lusting for are vintage riding boots… I think they may be Justin. You can find these on etsy and other places. They are the coolest bright blue and I agree, you need a pair! Good luck hunting them down, may the boot force be with you. 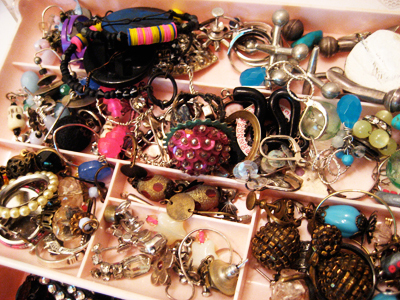 I thought I had accumulated a lot of ‘bling’ but I think you beat me. Gorgeous pieces.